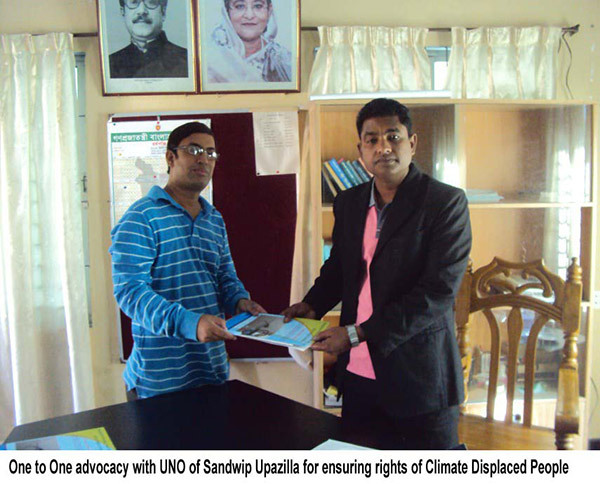 One to one advocacy with the local government and influential persons for ensuring housing land and property rights of climate displaced people held in Sandwip (An island near Chittagong). YPSA’s project team members met with Mr. Mostafa Kamal Pasa (Member of Parliament of Sandwip Upazila), Noor-E-Khaja Alamin (UNO of Sandwip), Abul Khair Nadim (Chairman of Musapur Union Parishad), Md. Javedul Islam (Chairman of Amanullah Union Parishad), Md. Samsuddin (Chairman of Gasua Union Parishad), Md. Mizanur Rahman (Chairman of Maitbhanga Union Parishad), Md. Saiful Karim (Acting Chairman of Sontushpur Union Parishad), Kazi Arif (Chairman of Horispur Union Parishad), Farzana Khanum (Acting Chairman of Mogdhora Union Parishad), Md. 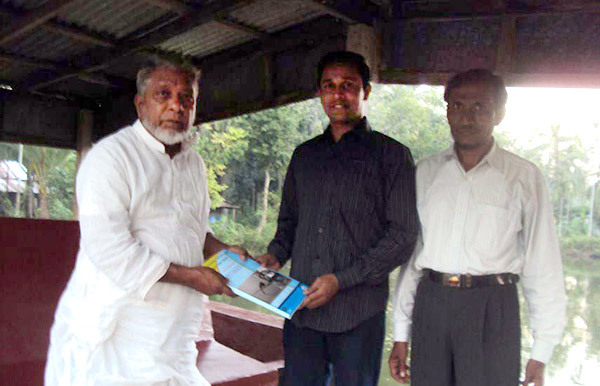 Delowar Hossain (Chairman of Dirghapar Union Parishad), Mohammed Ali Khasru (Chairman of Haramia Union Parishad), Abdul Malek (Chairman of Sarikait Union Parishad), Md. Anowar Hossain (Chairman of Azimpur Union Parishad), Md. Hasanuzzaman Mamun (Chairman of Rahmatpur Union Parishad), A.B.M Siddiqur Rahman (Commander of Bangladesh Moktijoddah Songshod, Sandwip), Mr.Rahim Hossain (Secretary of Sandwip Press Club). YPSA has been implementing the project titled “Bangladesh Housing Land and Property (HLP) Rights Initiative” since 2012 with the support of Displacement Solution (DS).